I wanted to have a light lunch today. A dosa or something. My team had other plans. And soon I found myself at Yoko, the sizzler joint beside our office. I am fairly neutral to sizzlers. I don't have a point of view on them. I don't see the point of them. I don't have anything against them. As Bourdain says, you deserve sizzlers if you are not particular about the meat you eat. Ouch! K and I used to share sizzlers when we were dating. We used to eat out every night. We needed to make our money stretch. Now I end up up having the whole thing. After a lot of experiments, I have figured out that I like the hamburger steak sizzler at Yoko and its alter ego Kobe. That's what I ordered for myself. The others were sharing sizzlers. Someone got very excited about the paneer in the sizzler. All I had to say was 'why'. My sizzler arrived late as had I. It was competent. I thought I would not be able to finish it. Was very proud when I did. I did a mental victory dance as I wiped off the meat sweat. Experience has taught me to have the meat first and then eat the veggies if there is any space left. Not that I have anything against the vegetables. In fact I love fries. Which is where I stop. I have rarely seen anyone eat at Yoko. Though Yoko was full today. It was a decent meal but it wasn't a 'Fort' meal to me. I was stuffed. Yet it left me hungry. The traffic's been very bad for the last couple of days. Yesterday it took me two and a half hours to cover a forty five minute stretch. I was famished. And was answering calls for restaurant suggestions through that. The stuff of Mrinal Sen films. I thought that the heavy meal today would help. But was stuck in a jam and famished again. Though we mortals weren't the only ones stuck in the traffic. Ganpati Puja is coming up. 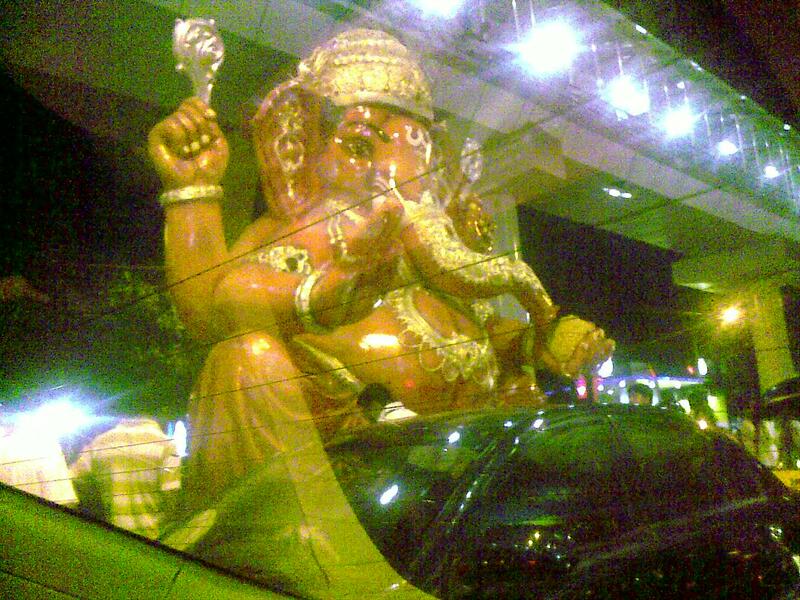 At the risk of punning horribly, there isn't a Modak (prasad/ holy offering of Ganpati Puja) in sight but the city is bathed in jams. I wonder why the local 'sons of the soil' political parties don't demand that offices be shut during Ganpati Puja. The biggest local religious festival. Eid, Ganpati Puja, Mount Mary Fair...tough times are coming up. Paraphrasing Uncle Marx, 'religion is the opiate of traffic jams'. I wouldn't trust a man who hath no opinion of what he ate. I would get excited with paneer in my sizzler. IF it's Paneer Tikka Indi at Jugheads (go try Chicken Tikki there when you go back to Saki Naka). At Yoko's, I'd happily take Mushrooms in Pepper Sauce!